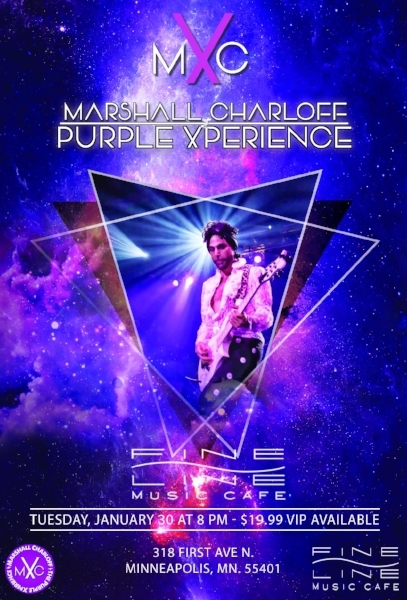 Join Minneapolis-native multi-instrumentalist and vocalist Marshall Charloff—as featured fronting numerous symphony orchestras worldwide in celebrating the music of Prince—along with his internationally-acclaimed band, the Purple Xperience. Marshall returns home for this ONE-NIGHT ONLY performance with special guests including Pepe Wille (the producer who first signed Prince and Marshall). True Prince fans appreciate true MUSICIANSHIP, and in this regard, the Purple Xperience truly has no equal. Minneapolis is on the world’s stage for Superbowl. Join us and Xperience the greatest of all Minneapolis legacies—PRINCE—with WORLD-CLASS talent. Tickets are only $19.99. VIP seating available.